So after a couple weeks of searching I finally settled on a portable Bluetooth speaker made by JBL. 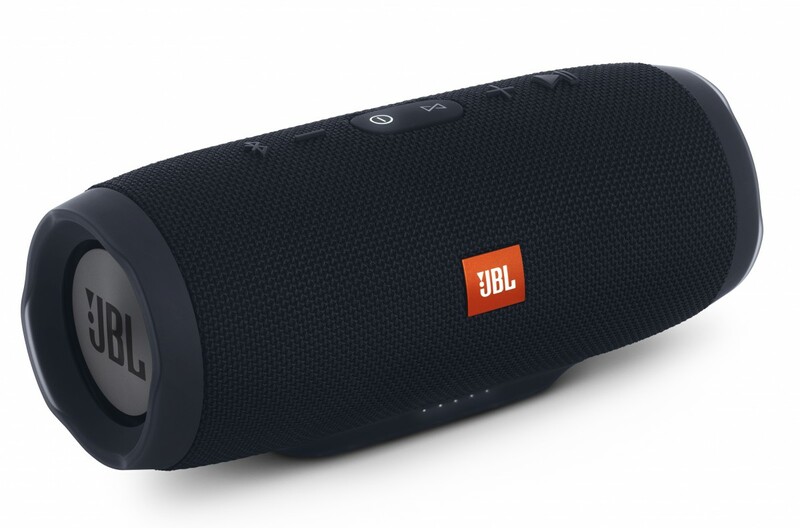 The JBL Charge 3 bluetooth speaker is one of very few units that also has a built in charging port for charging other devices like a phone or tablet. The sound for such a small device is quite impressive partially because of the two side firing bass radiators. The frequency response is rated at 65Hz-20kHz and really does do a good job of filling a large space with full clean sound that is not muddy but punchy bass and clean highs. Im using it in my workplace currently in a large mechanical room that's at least 2000 sq ft. and it has no issues filling it with music (not blaring loud but easily heard in all areas). I have an old Panasonic ghetoblaster that has honeycomb speakers that Ive used for years and the Charge3 blows that clean out of the room and its literally 1/4 the size! The 6000mAH battery is said to last up to 20hours of continuous use at moderate listening levels (I have yet to charge it after its first charge and it still has 1/4 of its battery level). I also like the fact that it has a 1/8" line in jack for plugging in a non Bluetooth mp3 player that I have. It has a full waterproof IPX7 certified rating and can be completely submerged if the rear compartment where the jacks are in is closed (yes it floats on the water if you choose to take it in the pool). If your looking for a small great sounding unit this may very well be the very best available.